Founded in the summer of 1936, Excel bottles soda in more than 10 flavors and also bottles Ski and Double Cola. Foxon Park has been making great tasting natural soda for more than 80 years. We've created more than 18 unique flavors, using only the finest ingredients - it's a family tradition. Harmony Springs was started in 1948 by Henry J Giza. Today, 3 generations later, the Giza family continues to use only the finest quality ingredients in its beverages. In 1912, spring water emanating from the base of Hosmer Mountain was used to establish the Hosmer Mountain Spring Bottling Works. The company has done business the old-fashioned, personal way ever since. Even today, it is still a family-owned and operated soda business. 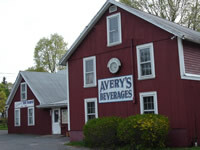 For over 40 years Hosmer has been bringing Soda home to eastern Connecticut. Prospect Hill Beverages, LLC is bringing back Tower Root Beer to the New England area using the original recipe bottled and distributed by Prospect Hill Bottling and Soda Water Co. Tower Root Beer was first established in Somerville, MA in 1914. The Conner family has continued a time honored tradition that dates back to the Civil War. From the landmark Conner Bottling Works, in Newfields, New Hampshire, the Conner Family has for the past five generations been producing and bottling "Squamscot Old Fashioned Beverages". Vermont Sweetwater Bottling Company is a small Vermont family owned and operated bottling company, producing eight all natural beverages, made from only the finest ingredients. Our goal at Yacht Club is to produce the highest quality beverage. We only use pure cane sugar, the best flavorings and extracts, natural artesian water, and glass bottle with crown finish to lock in the fizz and flavor.